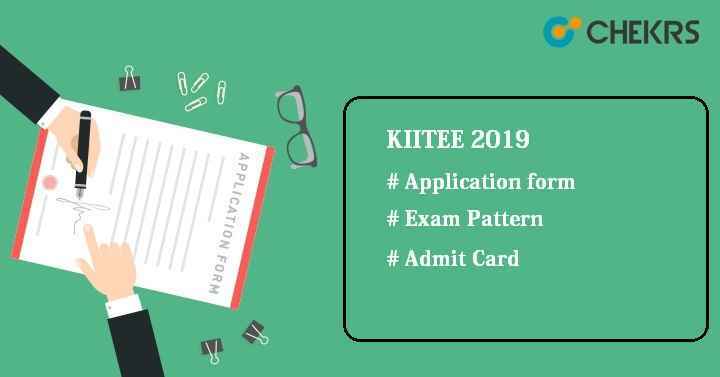 KIITEE 2019 Application Form: Kalinga Institute of Industrial Technology (KIIT) is an institute located in Bhubaneswar offers various under-graduate & post-graduate courses in Engineering, Bio-technology, Law, Fashion, and Film Studies etc. Candidates who have completed 12 in 2016/2017 or appearing in 12 in 2018 can apply for online application form. Minimum age should be 21. Candidates should have secured at least 60% aggregate marks in Diploma course from State Council of Technical Education of any state. Candidates must have scored at least 45% aggregate in Physics, Chemistry, Biology & English. Minimum age should be 17 & maximum age must be 35 as or on 31.12.2019. Must have passed 10+2 with minimum 45% aggregate in marks in any stream. For BSc LL.B, candidates must have science stream in 12th. Minimum age should be 20 years as or on 31.12.2019. Candidates must have subjects like Mathematics/ Business Mathematics/Economics/ Statistics. Candidates must have scored 10+ with minimum 50% marks. Candidates must have secured 60% in PCM in 10+2. Candidates must have appeared in National Aptitude Test in Architecture. Applicants should have passed class 12 with minimum 50% marks & having mathematics as compulsory subject. Must have born on or after 01.07.1998. Pass class 12 in any streams with 50% aggregate. Candidates must have secured minimum 50% in graduation and having Mathematics as compulsory subjects either in graduation or 10+2. Applicants must be born on or after 01.07.1995. Candidates who have passed or will appear in BCA/B.Sc from any recognized university. Must done graduation in BE/ BTech. Candidates who have appeared in GATE can also apply. Candidates must have bachelor’s degree in any branch of Science/ Agriculture/ Pharmacy/ Veterinary/ Medicine etc. He/ She must have scored at least 55% marks. Minimum age should be 24. Applicants must have passed B.A. LL.B/BBA LL.B/B.Sc. LL.B/B.L. with at least 55% marks. Candidate having M.Tech / ME/ MCA/ MBA or equivalent Degree with minimum 60% marks or M.Sc. /MA/M.Com /LLM or equivalent degree with at least 55% marks can apply. Applicants must have bachelor’s degree in MBBS/ BDS/ BAMS/ BHMS/ BNYS/ BPT/ BSc Nursing/ BPharm with at least 50% marks in aggregate. Go to Apply Online, Select the course and click over it. Click on Apply Online. KIIT Application Form will open on the screen. Enter the all required details, upload photo and then submit it. Candidates can also download the form and then fill it, paste photo & put signature on it. Attach 10 mark sheets and then send it by post at the given address “The Director, Admissions, KIIT, Koel Campus, Bhubaneswar – 751024, Odisha, India” on or before the last date (5:00 PM). No Application/ Examination fee will be charged for the KIITEE 2019. Kalinga Institute of Industrial Technology Entrance Exam (KIITEE) is an entrance exam conducted every year for the aspirants who wish to take admission into the various courses offered by KIIT. KIIT will invite the application form for interested and eligible candidates. Applicants have to appear in the KIIT Entrance Exam to get admission into KIIT. Here we have mentioned all the details like examination date, eligibility, result etc. Candidates are advised to go through the article to get updates related to KIITEE 2019.